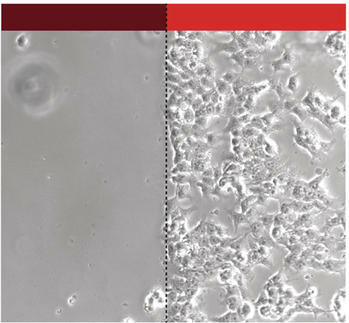 The OptoMatrix-OptoIntegrin system: OptoIntegrin-expressing cancer cells are seen adhering to the OptoMatrix, but only to the part illuminated with red (660nm) light. 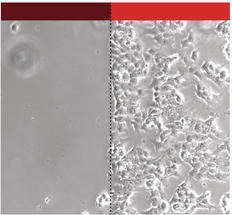 The ability of cells to adhere to each other and to their environment is the basis for multicellular life. Adhesion occurs via diverse receptors at the surface of cells that bind to specific ligands in their surroundings. Despite the importance of these adhesion receptors, there is a paucity of tools available for precisely controlling their interactions with the environment. To address this limitation, an interdisciplinary team of scientists from the Freiburg Signalling Research Excellence Clusters BIOSS and CIBSS have engineered an adhesion receptor and a complementary synthetic extracellular environment that can be activated by light. This system can be adapted to render other receptor–ligand interactions amenable to precise manipulation with light. Optogenetics uses light to control proteins and the cellular processes in which they are involved. “This technique has revolutionized the analysis of cellular signalling because it is non-invasive and because it allows precise spatiotemporal control of signalling processes”, says lead author of the study, Prof. Dr. Wilfried Weber. Optogenetics has been widely used to control processes inside the cells. The authors decided to bring optogenetics into the extracellular realm, specifically to test whether they could control receptor–matrix interactions using light. The team of researchers, which also included the groups of Prof. Dr. Gerald Radziwill and Prof. Dr. Wolfgang Schamel, focussed their attention on an important class of receptors – called integrins – that facilitate adhesion to extracellular matrix. “Although integrins have central roles in many normal biological processes, they can also promote growth and spread of cancer and have thus been explored as targets for anti-cancer therapies.” explains first author Julia Baaske. To control integrin-mediated adhesion using light, the scientists first developed an OptoMatrix coated with a light-sensitive plant protein called phytochrome B. Then they engineered an OptoIntegrin equipped with a phytochrome-interacting factor (PIF6) and expressed this receptor in cancer cells. Phytochrome B is usually found in its inactive form, but when exposed to a specific wavelength of red light it is activated and can be bound by PIF6; when exposed to infrared light it switches back to the inactive form. “The most exciting experiment was when we first shone red light on the OptoMatrix: the cells expressing OptoIntegrin immediately adhered to the matrix and activated intracellular signalling processes. Then when we used infrared light, they almost completely detached.” explains Baaske. “Essentially, we have developed light-controlled velcro for human cells”. Baaske J., Mühlhäuser W.W.D., Yousefi O.S., Zanner S., Radziwill G., Hörner M., Schamel W.W.A., Weber W.; "Optogenetic control of integrin–matrix interaction"; Communications Biology; 2019.